Gilpin's photographic record of a historical landscape - a landscape that changes people and in turn is changed by them - suggests a useful frame of reference for a study of the pictures currently being made by the small group of young women making photographs of the southwestern landscape. Linda Connor (b. 1944), for example, documents the region's petroglyphs, addressing quite literally the issue of how people have made their mark upon the landscape (fig. 8). With a similar interest in human markings, Marilyn Bridges (b. 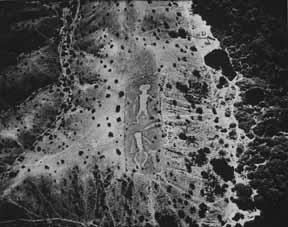 1948) makes aerial photographs of Native American earth-art and architecture (fig. 9). 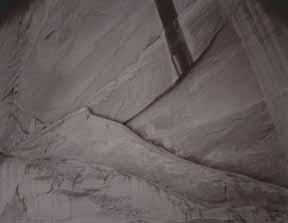 Her large prints are well suited to the grand, public scale of her subjects, while Connor's quiet 8 x 10-inch images are similarly faithful to the more intimate quality of the smaller rock carvings. Both women document a landscape with a particular historical past. Indeed, their pictures document the very stuff from which history is written, the tracings left by a people who had no written language with which to record their own lives. (35) Meridel Rubenstein (b. 1948), working in a very different style, has also made the historical past an explicit concern of her landscape work. She notes that she often makes sequential exposures of sites because "the lives of these remarkable places, from my limited vantage point, seemed to exist at once in the past, present, and future." (36) Her photographic collages combining portraits of people with images of their homes and homesites underscore this interest in the landscape as an evolving environment with a particular history. Among women currently working in the Southwest, Santa Feans Joan Myers (b. 1944) and Mary Peck (b. 1952) have been most devoted to documenting the regional landscape. The fact that this interest continues to set them apart (as it did Gilpin) from most of their female contemporaries suggests that landscape photography remains - nearly 150 years after the invention of the daguerreotype - a field dominated and largely defined by men. Yet the work of both Myers and Peck supports the idea that the few women who have tackled landscape photography have developed a new tradition for the genre, one focusing on the human elements of the physical environment. In 1982, Myers began photographing the Santa Fe Trail, the old wagon trail extending from Missouri southwestward to Santa Fe. She writes, "It was my challenge to photograph a feeling, an idea, a dream from the past using the landmarks of the trail and the tangible imagery of the present." (37) Her landscape views reveal the traces left behind by the nineteenth-century traders and immigrants who traveled down the trail or their later descendants who settled along the Iength of the route. 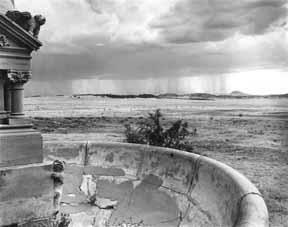 Myers depicts the graves of two early pioneers; the names carved deep into the stone at Inscription Rock, Oklahoma; the barbed wire stretched taut across the prairie at Round Rock, New Mexico; the ruins of a grandiose mansion along a desolate stretch of trail; the sprawl of modern Santa Fe at the end of the route, stretching out beyond the seventeenth-century plaza at its core (fig. 10). More recently, she has been photographing the remains of ten western relocation camps used to house Japanese-Americans during the Second World War. She writes, "What remains in these barren windswept places and what I choose to photograph is the imprint left from thousands of lives, hopes, and dreams." (38) Her pictures record names drawn in concrete and the remains of small gardens planted to soften the harsh, impersonal environment of the camps. Mary Peck has worked extensively in the open plains of eastern New Mexico and west Texas, seemingly empty, desolate stretches of land that have attracted few visual chroniclers (fig. 11). Ever since travelers began recording comments on this region, she notes, "most reactions have been unfavorable. This land has none of the things to offer that most people associate with a beautiful or grand landscape. There is no place for the eye to rest, no seeming point of interest." (39) But Peck finds it an interesting landscape, marked by its inhabitants' efforts to make it a useful or more hospitable space. People rarely appear in her pictures. Instead, one sees mere traces of their presence: old dirt roads, cattle crossings, abandoned windmills, broken-down cotton trailers, and stunted orchards. The spare austerity of Peck's work matches the austerity of the life these artifacts represent. The horizon stretches in a taut line across the middle of her 6 x 15-inch prints, accentuating a sense of limitless space and distance. Wide, empty skies proclaim the preeminence of the land and the futility of human gestures to change this world. Like Laura Gilpin (for whom she worked as a darkroom assistant), Mary Peck seems drawn to scenes that suggest people's efforts to accommodate themselves to the immutable fact of this physical environment. Gilpin never thought of herself as a "female" photographer and eschewed any discussion of gender as it related to her work. While critics of the 1960s and 1970s speculated about the existence of a uniquely feminine artistic sensibility, she maintained little interest in the possible existence of a particular "woman's eye." (40) Her pictures, she rightly thought, should be judged on their own merits, apart from any consideration of their maker. Thus it is ironic that Gilpin's photographic evocation of a historical landscape should prove so suggestive of a different, if not a distinctive, women's approach to landscape photography; one emphasizing empathy with the human import and human past of the natural world. This approach is an alternative both to the heroic tradition of nineteenth century landscape work, carried on in this century by Ansel Adams and his followers, and the romantic, allegorical style promulgated by Gilpin's pictorial mentors. Yet Gilpin's landscape pictures and those being made by contemporary women photographers, are not overtly feminist or political. Rather, they represent a new humanistic strain in landscape photography that regards people and the physical landscape as an integral whole, an approach offering great possibilities to all artists, men and women alike. New Haven: Yale University Press, 1987/Tucson: University of Arizona Press, 1997.